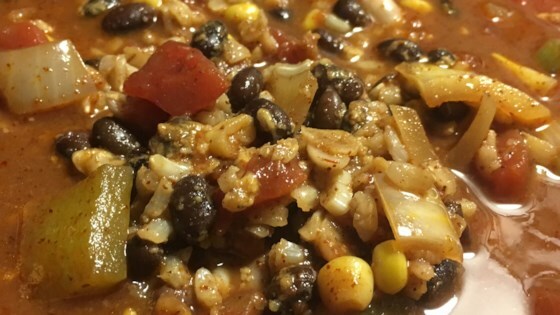 "Easy, delicious slow cooker recipe that uses some of those dry beans hiding in your pantry. Just about any bean can be substituted for the black-eyed peas. If you don't want to soak beans overnight, you can use the canned variety." Drain and rinse black-eyed peas thoroughly. Place peas, green pepper, onion, garlic, corn, and tomatoes, in slow cooker. Season with chili powder, and cumin; stir until well blended. Cover and cook on high for 2 hours. Stir in rice, and cheese. Continue to cook for a further 30 minutes. Peppers are filled with rice, veggies, and feta cheese. Do not use the dry variety beans. Must use canned beans or it turns out too dry. do not drain tomatoes or corn. Other than that a great fast and easy dish. I thought that this recipe was good. Not fantastic, but a good meal. I didn't put the rice in, makes it more like a stew.